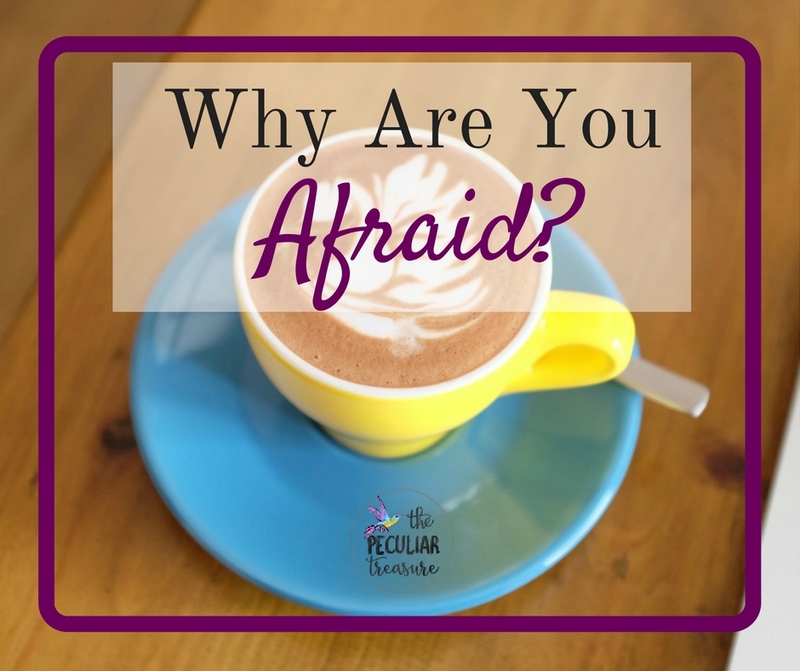 The Peculiar Treasure: Why Are You Afraid? Happy Mugspiration-Monday, friend! I hope you are feeling good this morning and ready to take on the day, and I hope you're having some strong coffee as you read this- because #coffeeisimportant. I hope your day is full of ambition, accomplishments, and joy. I hope that today you feel encouraged and ready to take on the world! But sometimes, we just don't feel like that. Sometimes, we are scared. Sometimes we feel afraid that we will never be the person we want to be. We are afraid of failing. And on those days, it's nearly impossible to feel good about ourselves, or feel like we can make a difference in the world. We tend to fold up and make ourselves small. And the irony is that when we let our fears take over, then we really won't be able to make a difference in the world. Friend, you may not be able to help the feeling of fear. And thankfully, that's not what will keep you from making an impact. However, what will keep you from it, is giving into that fear by living by it and altering your life around it. And when we realize we've been doing this, when need to ask ourselves why. Are you afraid because of a past hurt? Are you afraid because you hate unknowns? Are you afraid because you don't trust God? What is it that causes this piercing fear? Once you identify the problem, you can start to work through the issue. Honestly, as a Christian, I often find that when I am afraid, it comes back to me not trusting God. I fear He won't catch me if I fall. I fear that I will do the wrong thing and make Him angry with me, or I fear that He will ask me to do something I don't want to. But deep down I know that He will catch me when I fall and stand me back up, that even if I mess up He still loves me deeply, and if He asks me to do something difficult, it's truly for my good. So when I see that I am afraid, it is necessary for me to remind myself of this truth. Otherwise, I'll just keep wallowing around in fear and a mediocre life. 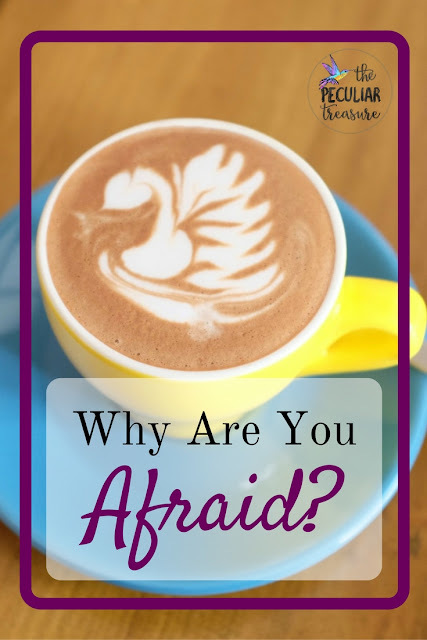 So why are you afraid? Really- think about it. Mull over it. Are you exaggerating the situation in your mind? Are you believing lies? Are you keeping yourself from something good because of what might happen? Please, friend, I beg you to work through it. I beg you to stop keeping yourself from a better life. Don't do what I often do. Don't just "know how" to fix it, continuing to live afraid anyway. No, let's commit to pushing through our fear and living well. What are you afraid of, and how can you avoid giving in to that fear? You make some great points!! Totally needed to read this! I'm glad it encouraged you! Thanks for reading! This is such a great post Kristin! I think too often we dont "mull over" our fears, which makes it really tough to develop self awareness and grow as a person. I love the interview I did this week on the vlog with Veronica Chung and how she says to befriend your struggles/fears. After, aren't fears just False Evidence Appearing Real!? Amen to that, girl! Thank you! I am so glad you enjoyed it! I am usually a pretty relaxed person but whenever something is bothering me, I can let it take over, and like you said above, I have to stop and remind myself that God is in control! Thanks for sharing this! Love this! I'm trying to be better about giving in to fear! Yes, very inspirational as always. God and I have been talking a lot about this and I am desperately trying to let fear not ruin my life. I'm not doing great, but it's posts like this that encourage me to take another step. Thank you. Preach it girl! There's no reason to be afraid when we have God. I do tend to worry too much. I need to work on this. Thanks for bringing it to my attention.